Nearly 1 million of the British Army died during the First World War. Everybody lost somebody. The importance of all of the men who died became very important in terms of the memorial for the lost soldiers. Previously in the history of battles only important people were buried in individual graves or even taken away from the battle field. Triumph or glory in defeat belonged only to the higher ranks. But the memorials for the First World War are mainly alphabetical, no mention of rank or social status. Just men, fought together, suffered together, died together. After the war, the French allowed families to move graves to local sites but the British decided to leave our graves as they were, and so many men had no grave. How could those at home grieve fully with no way to out pour? An army chaplain, the Rev David Railton, had the idea of the grave of the unknown soldier. A common grave for all people. 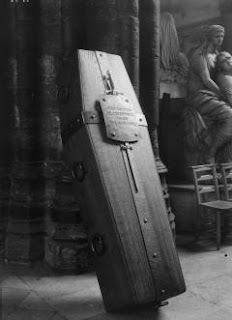 The coffin was brought to England on a destroyer and then taken by train to London. The carriage had a white painted roof and people stood at every station to see it go through. 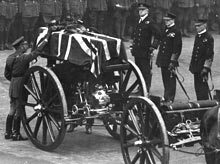 There are many special details about the whole course of events such as the train carriage used had also been used to transport the body of Edith Cavell, the sword place on the coffin came from the King's collection in the Tower, the casket was made of oaks from Hampton Court and the earth used to fill in the grave was brought from France. On the 11th November, it was taken from Victoria to Westminster by Gun carriage and the public numbers and atmosphere is compared to Princess Diana's funeral. This is the funeral of service. It included the 2 minutes silence at 11 o'clock, the first of which had taken place the year before in 1919. What I find most important is that there were no foreign dignitaries or government representatives at the service, the guests of honour were women that had lost their husband and all their sons in the war. Special permission had been given to make a recording of the service but only the two hymns were of good enough quality to be included on the record, the first electrical recording ever to be sold to the public. The grave is one of the most sacred places in Westminster Abbey. It is the only part of the floor that the congregation are not allowed to walk on. It is a tradition that Royal bridal bouquets are laid on the grave. Started by the Queen Mother who laid her own bouquet in memory of her brother who was killed on the Western Front in 1915, followed by the Queen, Sarah Ferguson the Duchess of York and more recently Kate Middleton the Duchess of Cambridge by a soldier later in the day after the photos were taken.